Posts from a time gone by. Times change, so do people, some of my views in some of these posts may well have changed over time but that’s the beauty of learning and growing. I’ve kept these for posterity. The Dazzle Rebel Show is on air now! Tune in to TBFM for some of the best Back To School rock! The Dazzle Rebel Show on TBFM TONIGHT! 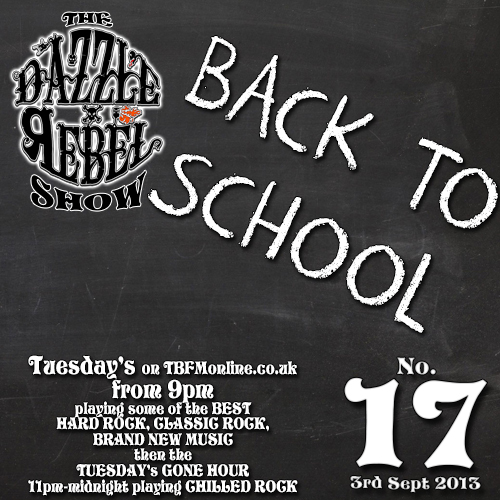 Tonights show on TBFM Online Radio aims to take you back to your school days with a Back to School Special! Playing a diverse range of tracks, many of which chosen by TBFM listeners, ranging from Joy Division to Madness, Supertramp to Van Halen plus some great music from emerging bands such as Exit State, Black Belt Karate, Titans & Kings, New Generation Superstars, JettBlack and Agenda. Also TBFM’s very first play of the new single “Here We Stand” by New Device! It’s such a jam-packed, hoot-tootin’, banjo-shootin’ show you’ll forget that you’ve got school in the morning! And then thank god it can go away! Turn On, Tune In and Rock the FOOK Out! Sod of the neighbours who cares if they shout? To the TBFM Internet Chatroom!